My research is mainly focused on decadal to centennial climate variability and predictability, including the Atlantic multidecadal oscillation (AMO), Pacific decadal oscillation (PDO) and Southern ocean centennial variability. One of my interests is to understand the mechanisms that control these decadal variabilities in the fully coupled model. I also use diagnostic and prognostic methods to estimate their potential decadal predictability. The interaction between decadal variability and anthropogenic forcing is also a topic I’d like to work on. My interests also include assessing the role of natural decadal variability in recent sea surface temperature and SST trends in observation. We examine GFDL FLOR model in detail to evaluate the mechanism of the simulated PDO (Zhang and Delworth 2015, published in Journal of climate). 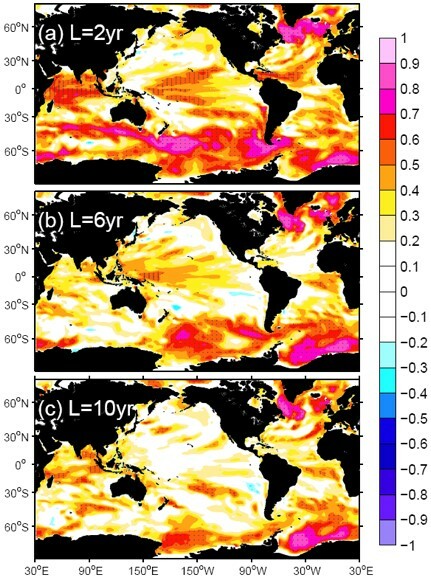 We find that a number of factors contribute, including extra- tropical air–sea interaction, propagation of internal oceanic Rossby waves, ocean convective feedback, and shifts in the boundaries of the subtropical and subpolar gyres in response to wind stress changes. In response to global warming, the PDO amplitude is significantly reduced, which appears to be associated with a weakened meridional temperature gradient in the KOE region (Zhang and Delworth 2016, published in Journal of climate). The PDO time scale becomes shorter in a warm climate, due to increased phase speed of internal Rossby waves as a result of increased ocean stratification. The diagnostic average predictability time (APT) method shows the most predictable SST pattern in the Southern Ocean (SO) is closely related to the mature phase of a mode of internal variability that is associated with fluctuations of SO deep ocean convection. (Zhang et al. 2017a, published in Journal of Climate). The physical pattern of this variability has a uniform sign of SST anomalies over the SO, with maximum values over the Amundsen–Bellingshausen–Weddell Seas. Perfect model predictability experiments are conducted starting from 10 different initial states, showing potentially predictable variations of Antarctic bottom water (AABW) formation rates on time scales as long as 20 years (Zhang et al. 2017b, published in Journal of Climate). As a complement to this perfect predictability study, the authors also make hindcasts of SO decadal variability using the GFDL CM2.1 decadal prediction system. The success of the hindcasts, especially in reproducing observed surface cooling trends, is largely due to initializing the state of the AABW cell. Liping Zhang*, Thomas L. Delworth and William Cooke 2018: Simulated changes of Southern Ocean air-sea heat flux feedback in a warm climate.To be submitted to Climate dynamics. Liping Zhang*, Thomas L. Delworth, William Cooke and Xiaosong Yang, 2018: Natural variability of Southern Ocean convection as a driver of observed climate trends. Accepted by Nature Climate Change. Liping Zhang* and Thomas L. Delworth, 2016b: Impact of the Antarctic bottom water formation on the Weddell Gyre and its northward propagation characteristics in GFDL model, Journal of Geophysical Research: Oceans, 121,5825-5846. Liping Zhang* and Thomas L. Delworth, 2016a: Simulated response of the Pacific decadal oscillation to climate change, Journal of climate, 24, 3971-3988. Liping Zhang*, Thomas L. Delworth and Fanrong Zeng, 2016: The impact of multidecadal Atlantic meridional overturning circulation variations on the Southern Ocean. Climate Dynamics, p1-21, doi:10.1007/s00382-016-3190-8. 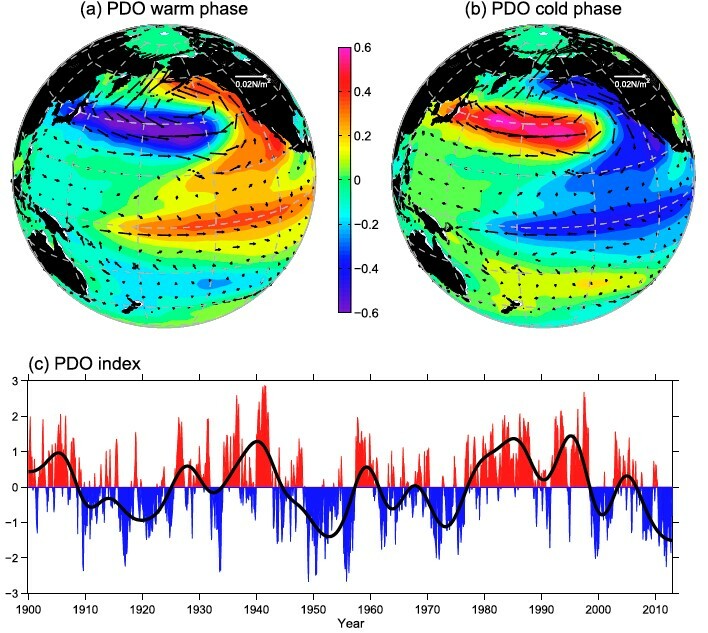 Liping Zhang* and Thomas L. Delworth, 2015: Analysis of the Characteristics and Mechanisms of the Pacific Decadal Oscillation in a Suite of Coupled Models from the Geophysical Fluid Dynamics Laboratory, Journal of climate, 28 (19), 7678-7701. Liping Zhang* and C. Zhao, 2015: Processes and mechanisms for the model SST biases in the North Atlantic and North Pacific: A link with the Atlantic meridional overturning circulation, J. Adv. Model. Earth Syst., 7(2), 739-758. Liping Zhang*, C. Wang, Z. Song, and S.-K. Lee, 2015: Remote effect of the model cold bias in the tropical North Atlantic on the warm bias in the tropical southeastern Pacific, J. Adv. Model. Earth Syst., 6(4), 1016-1026. C. Wang, Liping Zhang*, S.-K. Lee, L. Wu and C. R. Mechoso, 2014: A global perspective on climate model biases. Nature climate Change, 4, 201-205. Liping Zhang*, C. Wang and S.-K. Lee, 2014: Potential role of Atlantic warm pool-induced freshwater forcing in the Atlantic meridional overturning circulation: Ocean-sea ice coupled model simulations. Climate dynamics, 43, 553-574. Liping Zhang*, C. Wang, 2013, Multidecadal North Atlantic Sea surface temperature and Atlantic Meridional overturning circulation variability in CMIP5 historical simulations. Journal of Geophysical Research: oceans, 118, 5772-5791. Liping Zhang, Lixin Wu, Bolan Gan, 2013: Modes and Mechanisms of Global Water Vapor Variability over the Twentieth Century. J. Climate, 26, 5578–5593. Liping Zhang, Lixin Wu, 2012: Can Oceanic Freshwater Flux Amplify Global Warming? Journal of Climate, 25, 3417–3430. Liping Zhang, Lixin Wu, and Jiaxu Zhang, 2011: Coupled Ocean-Atmosphere Responses to Recent Freshwater Flux Changes over the Kuroshio-Oyashio Extension Region. Journal of Climate, 24, 1507-1524. Liping Zhang, Lixin Wu, and Jiaxu Zhang, 2011: Simulated Response to Recent Freshwater Flux Change over the Gulf Stream and Its Extension: Coupled Ocean–Atmosphere Adjustment and Atlantic–Pacific Teleconnection. Journal of Climate, 24, 3971-3988. Liping Zhang, C. Wang and Lixin Wu, 2011: Low-Frequency Modulation of the Atlantic Warm Pool by the Atlantic Multidecadal Oscillation. Climate Dynamics, 39, 1661-1671. Liping Zhang*, Lixin Wu, and Lisan Yu, 2011: Oceanic Origin of Recent La-Nina Like Warming Trend in the Tropical Pacific, Advance in Atmospheric Science, 28, 1-9, AAS20100129.